Thumbprint Cookies are a classic Christmas Cookie around the holidays. 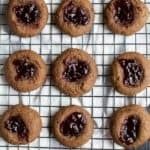 These CHOCOLATE RASPBERRY THUMBPRINT COOKIES have a subtle chocolate flavor with a burst of raspberry that you’ll fall in love with! Roll dough into 1″ balls and place on parchment lined baking sheets (or you could use silicon mats, which is what I prefer) about 2″ apart. Using your thumb, press each ball in the middle making a slight imprint. Add 1/2-1 teaspoon of raspberry jam to each chocolate ball imprint. Remove cookies from the oven and let cool on a wire rack. Serve!